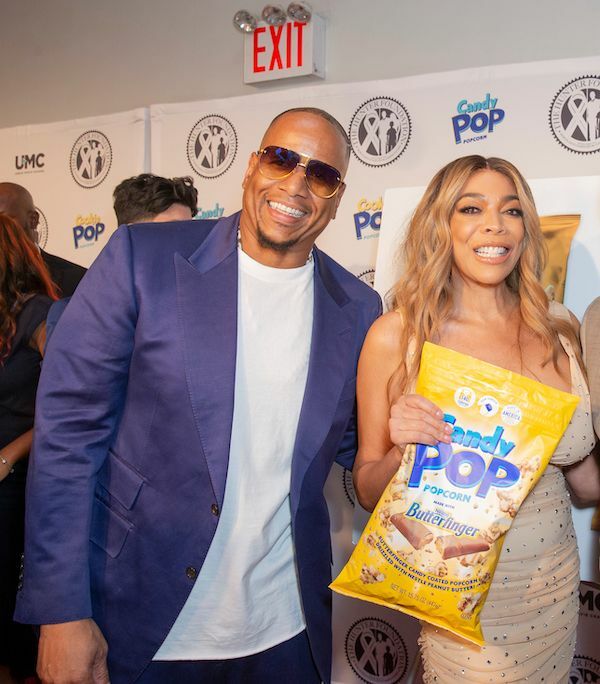 News broke earlier today that Wendy Williams filed for divorce from husband of 22 years Kevin Hunter, citing irreconcilble differences and stating they've been separated for 6 months. He is also her manager. The issue of support for their son, Kevin Jr., has not been solved. The kicker: Wendy served him the papers this morning - around 6:30am - at the studio of "The Wendy Show". He's there pretty much everyday since he's a "producer" on the show. It all happened before she recorded today's 10am ET live episode. Glad he can joke about it. Because we see nothing funny, especially since he was caught AGAIN with his alleged mistress Sherina Hudson this weekend, with her stomach still showing signs of having a baby recently. The Daily Mail followed the two throughout this past weekend, snapping pics and videos of them around New Jersey, in and out of their alleged hideaway house, and grocery shopping at Whole Foods and such. According to DM, who posted the picture receipts, Kevin Hunter has allegedly been living large with his mistress. He seemingly gifting her with a $215,000+ gold Ferrari Portofino, a diamond necklace and a Chanel bag that she showed off with her post baby tummy on display. Oh, and he seems to have copped himself a brand new Rolls Royce. Now, we see what probably got her fed up enough to file for divorce: That marital money allegedly leaving the marriage. Sherina was also pictured with a fresh wash-n-curl. Whew chillay. The audacity. Williams is demanding the marriage be dissolved, that the court equitably divide the parties’ marital property, and that the appropriate amount of child support be established. Wendy pre-taped a second show today that is to air tomorrow, so it's unclear if she will announce it then. The "Wendy Show" spokespeople put out a statement saying they do not comment on the Hunter family's personal matters. NEXT: BREAKING: Wendy Williams Files For Divorce!